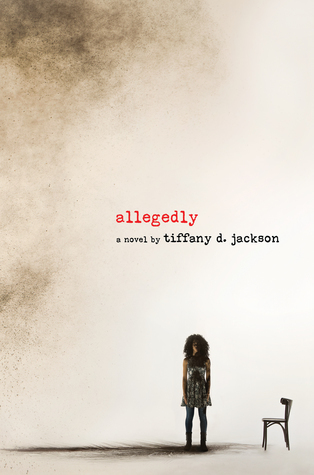 Allegedly by Tiffany D. Jackson. Grades 9-12. Katherine Tegan Books, January 2017. 400 pages. Reviewed from egalley provided by publisher. Mary Addison is familiar with the system. She was arrested and put in juvie (what she calls "baby jail") when she was nine years old for murdering a white baby. Allegedly. Mary never confessed to her crime. In fact, she remained stubbornly silent through much of the proceedings. She spent years in baby jail and three months ago they moved her to a group home for troubled teens. Life in the group home is depressing and dangerous: there's nobody Mary can trust, including the adults who are supposed to be taking care of them. Luckily, Mary has plans. She's been saving her meager allowance, studying for the SATs as best she can, and she aims to get her GED and go to college, to build a better life for herself. Her dreams of her life to come are sometimes all she has to cling to. She keeps quiet, always silent, and does what she has to do to keep her dream alive. And then Mary gets pregnant. And suddenly her dreams take on a whole new importance. She's got to survive, she's got to get out and move on to something better, not only for herself but for her unborn child. But when Mary learns that the system may not let her keep her baby, that she may be forced to give him up to foster care, she knows that it's time to come clean. It's finally time to talk, to share the truth about this horrific crime that she was accused of. Buckle up, it's going to be a wild ride. This book gripped me from the very beginning and I knew that it was going to be a book I wouldn't want to put down. Oh, how true that turned out to be. It's a compelling page-turner with a character that it's easy to root for. The dramatic plot twists kept me turning the pages, but this is also a book with a lot to say between the lines. Because the bottom line is that if the baby Mary's accused of killing hadn't been white, the trial wouldn't have exploded the way that it did. When Mary lifts her head up and starts to get interested in changing the verdict, she discovers that she's achieved an impressive level of notoriety: everyone knows her story. The book opens a window and shines a mirror into the life of a teen who really has nothing. For those of us raised with privilege, it's amazing the obstacles that Mary faces to something relatively simple like take the SAT. She doesn't have ID and she doesn't have a parent who can just grab her birth certificate out of the safe and help her get one. She has to depend on public transit to get wherever she's going, making it difficult to get to some places on time. She doesn't have the right calculator and the price tag on a graphing calculator makes her jaw drop. Maybe Mary's biggest obstacle is that nothing is expected of her. The social workers dump her into a vocational course on cosmetology when she's capable of so much more. But Mary knows they would laugh in her face if she asked them for help in achieving what she really wants: a college degree. Bottom line, this is a compulsively readable novel that's great entertainment but also a commentary on race and poverty. Well done. I would hand this in a heartbeat to teens who enjoy the edgy novels of Ellen Hopkins. Readers who are looking for more strong, gritty heroines facing difficult situations might like Speak by Laurie Halse Anderson or All the Rage by Courtney Summers. Readers who want to read more about teens in prison or who have committed crimes might enjoy After by Amy Efaw or Monster by Walter Dean Myers or The Sacred Lies of Minnow Bly by Stephanie Oakes.